An all-star squad of developers is starting to see the results of teaming up to build a massive mixed-use development site within the Lower East Side. Essex Crossing is one of the city’s most comprehensive developments in recent history. The project brings together several developers and architects to build more than 1,000 new apartment units, 400,000 s/f of office space, and 450,000 s/f of retail space between nine different buildings. This new Lower East Side is roughly bordered by Ludlow Street to the west, Grand Street to the south, with some buildings stretching past Clinton and Rivington Streets. 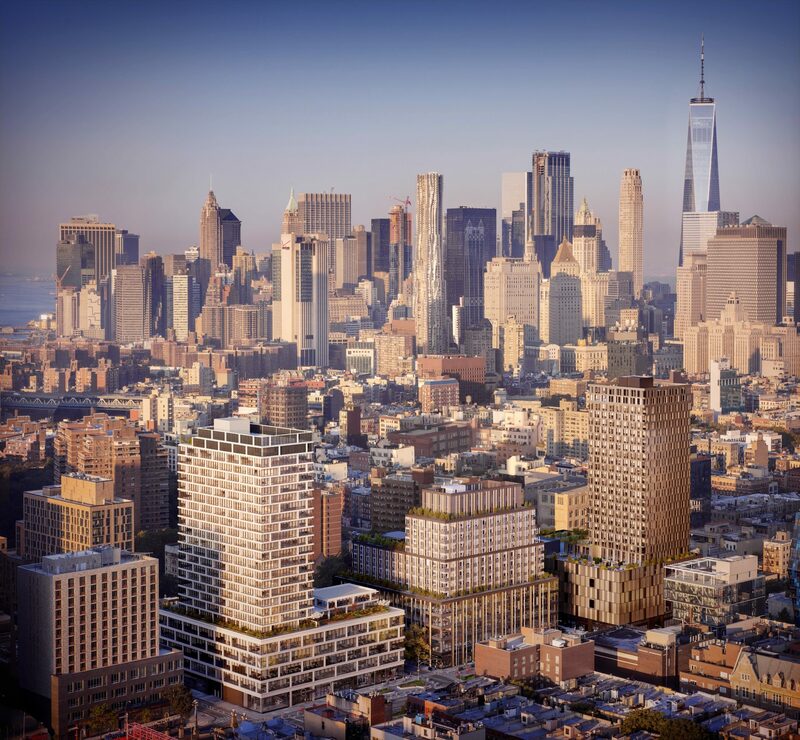 For the live portion of the campus, Essex Crossing features The Essex at 125 Delancey Street and The Rollins at 145 Clinton Street, with 180 Broome Street coming in 2020. Each of the residential developments tries to differentiate itself, with The Essex offering entertainment and retail spaces on lower levels that include a 14-screen movie theater, and The Rollins offering a more traditional approach to luxury living. Tenants may also be living in the same building as their office at 180 Broome and 202 Broome Streets, which offer both residential and office space. The site also includes 116 Delancey Street, 140 Essex Street and 121 Stanton Street which will offer residential rentals and retail space. The development also carved out space at 175 Delancey Street for a 14-story building with 99 rentals for senior resident. The Frances Goldin Apartments will house an NYU Langone Medical Center, a community center and ground-floor retail. The International Center of Photography is also expected to relocate into a portion of 242 Broome this year. But at the center of the expansive development lies The Market Line. The 150,000 s/f marketplace will stretch three blocks along Broome Street and offer everything from local food, fashion vendors, to art and music venues. So far, food establishments including Ample Hills Creamery, Doughnut Plant and Veselka have already signed on for spaces at The Market Line. While the project is ambitious, the developers were confident that people would be drawn to the lifestyle model they’ve designed. The developers wanted to offer their residents the ability to stay completely within Essex Crossing, but not take away from the fact they are situated in the middle of the eclectic Lower East Side. Since each of the Essex Crossing buildings was tackled by different builders and architects, there could have been the issue of too many cooks in the kitchen. But Benjamin Baccash, assistant vice president at Taconic, said they were all focused on the bigger picture. This ambitious project was tackled in phases, with Phase 1 bringing online The Rollins, that began leasing in early 2018 and is already fully leased, and 242 Broome Street, which already has 80 percent of its apartments sold. The first phase also opened up part of NYU Langone’s medical facilities and Trader Joe’s and Target at the corner of Clinton and Grand Streets. Essex Crossing’s second phase will start with the launch of rentals at The Essex, with more move-ins over the next few weeks, according to Isaac Henderson, L+M’s development director for Essex Crossing. With the massive Essex Crossing beginning to take shape, Henderson noted the development partners wanted their project to have a symbiotic relationship between Essex Crossing and the Lower East Side. Now that buildings have reached full capacity and others are fill fast, the area is already seeing a wave of new attention. Tirosh added that Essex Crossing was a unique development where residents could stay within Essex Crossing all day if they chose to, even though they’re surrounded by the Lower East Side. But for the developer collective, one of the priorities for Essex Crossing was to assimilate into the larger Lower East Side neighborhood. Instead of labelling themselves as a city within itself, much like the Hudson Yards mega-development, the developers prefer to embrace the appeal of the being surrounded by the iconic Lower East Side.